"The walls of the garden, the first light"
Ilford, Essex, with its two large parks, east and west of the River Roding, is notable for its semirural setting, yet it is only fourteen kilometers northeast of central London. A spirited six-year-old, Denise Levertov could easily walk the three blocks from her home at 5 Mansfield Road to the gates of Valentines Park, with its cultivated lawns and ample pleasure grounds. There, along the Long Water canal, she could wander alone among the stately London plane trees she grew to love and, seated in a leafy alcove, admire their reflection in the green water. Or she could pause in the romantic rose garden and imagine a scarlet bouquet gleaned from its pickings. Best of all, she could sit in a brick alcove at Jacob's Well and make a wish, poised in reverie before the clear water. (This wishing well would inspire future poems.) If she wanted to play in a more ancient, wilder landscape as she grew older, she could ride on her scooter farther, to Wanstead Park, with its dense forest of firs and pines, its mysterious grotto, and its larger ornamental waters. She could pretend to sail "grassy seas in the three-masted barque Emanuela" and undertake daring adventures with a friend. In both parks there were hidden paths amid the hedges to stimulate her imagination and old mansions to awaken a historical awareness. Accompanied by her older sister, Olga, she could walk in the lush fields and farms beyond the town's borders, which were then easily accessible by foot, or travel deeper into the countryside on the red double-decker, open-topped buses. Unencumbered by a regular school day-she was homeschooled by her mother-Denise roamed this landscape until age twelve and returned to it frequently thereafter in her work. Wanstead drew me over and over into its basic poetry. Levertov's birthplace provided a fundamental refuge from danger, an interest in the past, and a lasting penchant for imaginative transformation. As a child, Denise could not articulate the source of that danger, but she certainly intuited it, for, in the poem above, she links herself with her parents, who were themselves outsiders and immigrants in England. Estranged in a new environment, she now understands their predicament in her childhood. A sense of hazardous alienation lingers here, but Levertov does not dwell upon it. Rather, she reinforces a primary kinship with the places and people she loves, and she invests her childhood home with the remembered sweetness of a golden age: "the walls of the garden, the first light." Priscilla Denise Levertoff was born at 9:15 A.M. on October 24, 1923, at 24 Lenox Gardens, in the town of Ilford, Essex. She was the youngest of three daughters born to Beatrice Adelaide Levertoff, née Spooner-Jones, an artistic Welsh school teacher, and the Reverend Paul Philip Levertoff, a scholarly Russian Jew who had converted to Christianity and been ordained as a priest of the Church of England. Her parents had met in 1910 in Constantinople, where her mother was teaching in a secondary school run by the Scottish Church and her father was lecturing as a visiting scholar. They were married in England, lived in Warsaw and Leipzig before and during World War I, and settled in England soon after the war ended. Their first child, Philippa, born in 1912, lived only six months before dying of a respiratory ailment. She was buried in Leipzig, where in 1914 their second child, Olga Tatjana, was born. Nine years later, Denise arrived, the only one in her family born in England. Cultural heterogeneity and personal loss marked the lives of Levertov's nuclear family. Her parents (especially her father) were "exotic birds" in this ordinary English thicket. They had endured religious persecution, expatriation, family tragedy, and war, which could have crippled people with fewer intellectual and spiritual resources. Downplaying their privation, Levertov lauded these resources: not only were they all writers, her mother sang lieder and her sister was a fine pianist, and Denise emphasized the impact of the household's foreign atmosphere upon her evolving identity. Even though she grew up with a passion for the trees, churches, and wildflowers of rural England, she viewed herself as an outsider: "Among Jews a Goy, among Gentiles ... a Jew or at least a half-Jew ... among Anglo-Saxons a Celt; in Wales a Londoner ... among school children a strange exception." This sense of anomaly continued into adulthood-Levertov often felt English, or at least European, in the United States, where she was usually considered American, and American in England-but it did not inhibit her artistic development. Her family had given her such confidence that, though "often shy," she "experienced the sense of difference as an honor, as a part of knowing (secretly) from an early age-perhaps by seven"-that she was "an artist-person and had a destiny." What were the attributes of the members of this family who invested the child Denise with such inner strength, despite their own earlier suffering? What clues to her future do we find in their backgrounds? A richly textured robe of family legend envelops each of them. Paul Philip Levertoff was a traditional patriarch. Both his perceptions of the world and his emotional attitudes derived from the Russian Jewish shtetl in which he was born and raised. In that world, as a boy of exceptional intellectual ability and linguistic talent, he was devoted to the divinely decreed obligation to study Scripture, a duty and a joy that offered "a means of escape from dark reality," whether it be domestic troubles or religious persecution. He also had a "bold heart" and a rebellious personality. As he grew into manhood, his theological studies carried him beyond the Pale of Settlement, areas in Eastern Europe in which Jews were allowed to live, and away from the mainstream of his people. After he read the New Testament, he became convinced that Jesus was the Messiah and embarked upon the project of reconciling the two faiths. For the rest of his life, he considered himself a Jewish-Christian. In adulthood, Levertov saw this "bold heart," the "certainty of wings" for the soul, as the essence of her father's personality. In her poem "Wings in the Pedlar's Pack," and in her essay "The Sack Full of Wings," she compares her father with Marc Chagall, his contemporary. Both men saw, as children, "an old pedlar ... carrying a big sack over his shoulder," trudging along the streets of Orsha, her father's hometown, or through the city of Vitebsk, Chagall's birthplace, which he made famous in his painting "Over Vitebsk." This figure may allude to the Christian, anti-Semitic image of the Wandering Jew, who, in medieval legend, taunted Jesus en route to the Crucifixion and was then cursed to walk the earth as a beggar until the Second Coming. Paul Levertoff's Hasidic beliefs, imbued with the ardor of ecstasy inherited from his rabbinic ancestor, "the Rav of Northern White Russia," contravened this noxious stereotype. He knew that the pedlar's sack contained "wings which would enable people to fly like birds," and he later interpreted that knowledge to incorporate the Gospel of Jesus as the Messiah. Paul Philip Levertoff was born in Orsha, Belarus, a town south of Vitebsk on the Dnieper River, to Saul and Judith Levertoff. His birth date is unclear: one source states October 12, 1875; another states October 14, 1878. He preferred the latter. His birth name was not "Paul Philip," a Christian name. In a letter in Hebrew, his father, Saul Levertoff, employs the Hebrew-Yiddish name "Feivel," which was probably Paul's given name. His family were originally Sephardic Jews who emigrated from Spain to Russia after the Spanish Inquisition and there intermarried with other Jewish families noted for their piety and learning. According to family legend, he was a descendant of the founder of Chabad Hasidism, Rabbi Schneur Zalman, who was his mother's uncle. The family thus had strong Hasidic roots, part of Paul's heritage that he never rejected. He cherished an inherited copy of his great-uncle's central treatise, The Tanya. This first full-length biography of Anglo- American poet and activist Denise Levertov (1923-1997) brings to life one of the major voices of the second half of the twentieth century, when American poetry was a powerful influence worldwide. 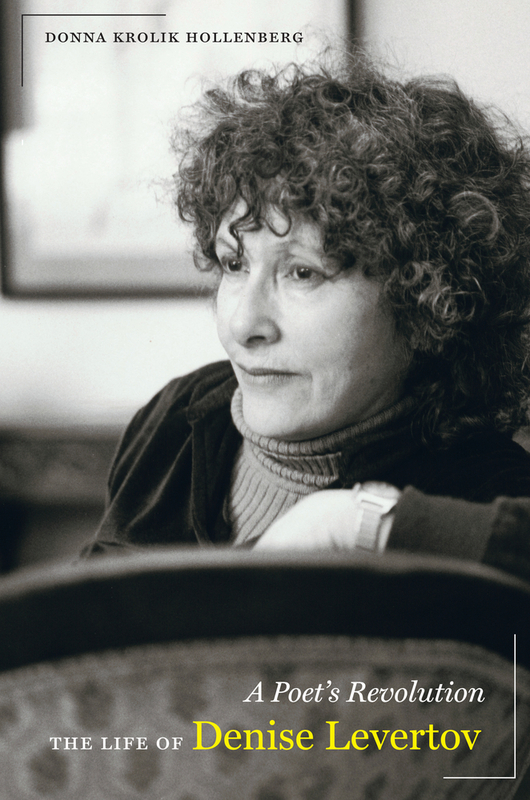 Drawing on exhaustive archival research and interviews with 75 friends of Levertov, as well as on Levertov’s entire opus, Donna Krolik Hollenberg’s authoritative biography captures the full complexity of Levertov as both woman and artist, and the dynamic world she inhabited. She charts Levertov’s early life in England as the daughter of a Russian Hasidic father and a Welsh mother, her experience as a nurse in London during WWII, her marriage to an American after the war, and her move to New York City where she became a major figure in the American poetry scene. The author chronicles Levertov’s role as a passionate social activist in volatile times and her importance as a teacher of writing. Finally, Hollenberg shows how the spiritual dimension of Levertov’s poetry deepened toward the end of her life, so that her final volumes link lyric perception with political and religious commitment. Donna Hollenberg is a Professor of English at the University of Connecticut, Storrs. She is the author of H.D. : The Poetics of Childbirth and Creativity and the editor of Between History and Poetry: The Letters of H.D. and Norman Holmes Pearson and HD and Poets After.